Or maybe it’s about me being unable to sit in a room alone with strawberries and cream and not eat them? 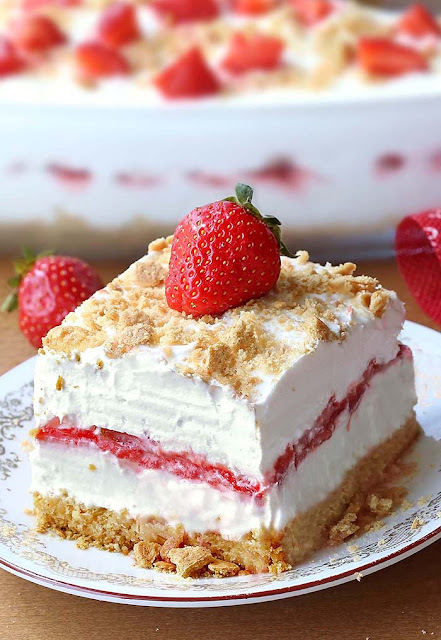 One thing is clear, I think “The most difficult part of making this No Bake Strawberry Cheesecake Lasagna is trying not to dunk the Strawberries in fresh cream and eat them as you layer them in the pan”. It’s as simple as that. No Bake Strawberry Cheesecake Lasagna - a dessert lasagna with graham cracker crust, cream cheese filling, strawberries and cream topping. Set 5-6 whole strawberries aside for decoration. Wash, hull, and slice remaining strawberries. Layer the berries evenly on top of the crAeam cheese mixture.